If your order weighs less than 13 ounces, save huge on shipping with USPS first class (with tracking number). This product weighs 34.3 oz. Nature’s Sunshine’s Aloe Vera Juice is packed full of nutrients, like vitamins B1, B2, B6, C, niacina-mide, choline, and 18 amino acids. Nature’s Sunshine processes the aloe vera leaf in a way different from companies that claim their juice has lost its “disagreeable taste.” This method of over-processing leaves you with a product that is only, at best, 10 to 15 percent aloe vera. NSP collects the 100 percent pure liquid that flows from the gel found in the aloe vera leaf after removing the outer green portion that contains aloin. 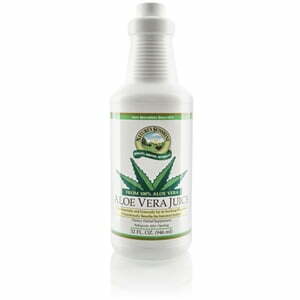 Nature’s Sunshine Aloe Vera juice contains a small amount of sodium benzoate, as a preservative, to prevent bacterial contamination. This supplement can be taken internally with juice or water, as well as used externally and may tone or moisturize the skin. Instructions: For best results, drink 2 to 6 ounces daily. Drink this refreshing vegetable juice with meals as is, or mixed with fruit or vegetable juices if desired. Citric acid, potassium sorbate, and sodium benzoate (as preservatives).